Can you admit it when you're wrong? Do you believe new facts will help you change your opinion? A growing body of research has found that we're even more stubborn and steadfast than we realize, and this can have troubling implications for a democracy based on an educated society. "This isn't just about being educated or knowledgeable," said Brendan Nyhan, a political scientist who studies political misperceptions. "Those are often the people that are more resistant to information they don't want to hear." You might believe you base your political views on hard facts, but in many cases, our voting behavior stems more from our beliefs. Nyhan's paper, titled "When Corrections Fail: The persistence of political misperceptions," found that when we encounter facts that contradict those beliefs, the facts are either ignored or twisted to support our positions. And it's not limited to one political party -- both liberals and conservatives share the same problem. "There's an idea out there that if we just give people the facts, they can make good decisions," said Nyhan. "I think people can make good decisions, but just giving them the facts is not going to do it." What can be done about it? 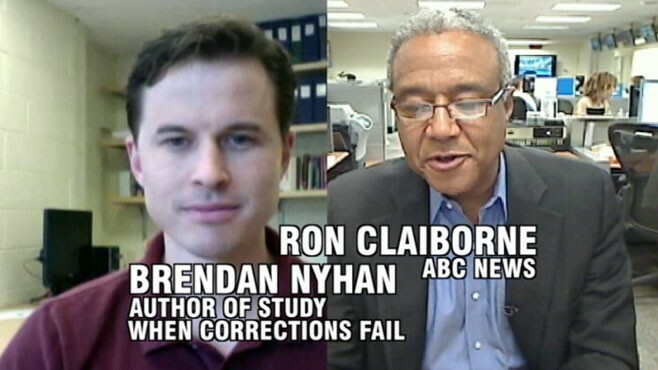 Nyhan has some ideas, which he shared with ABC's Ron Claiborne in today's Conversation. So consider the facts, and watch today's Conversation with an open mind.